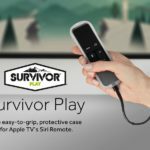 Apple’s SVP of Internet Software and Services Eddy Cue said in an interview yesterday that there are more than 2,000 apps in the Apple TV App Store, with games as the leading category. 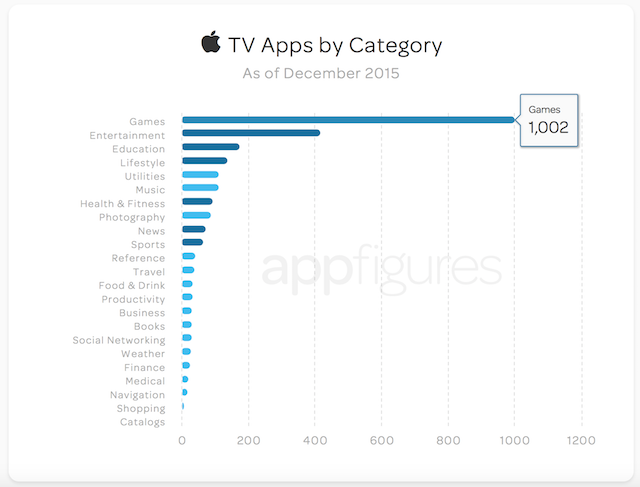 Today, AppFigures has revealed that there are currently 2,624 apps available for download in the Apple TV App Store, with games making up roughly 38% of all apps, while also predicting that the store will be hitting 5,000 apps in about a month and 10,000 apps in early 2016. The analysis reveals that while monetizing on any App Store is a challenge, the options are a bit more limited on the Apple TV App Store due to the lack of ads, so developers are currently forced to monetize by charging for their app or using in-app purchases. Currently, 39% of apps on the Apple TV App Store are paid apps, with majority of them costing $2.99 or less. 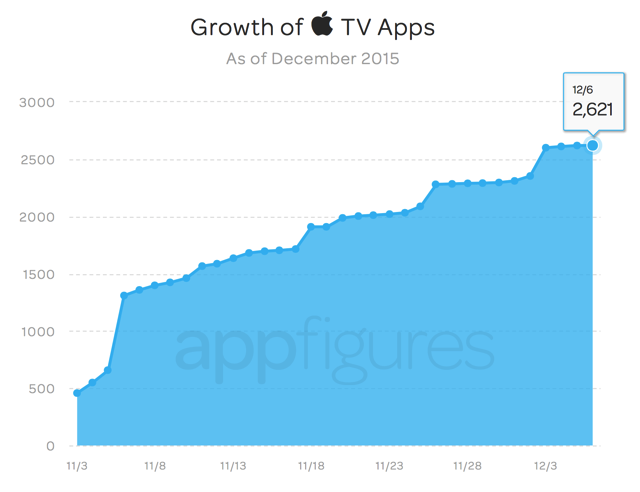 There are 2,624 apps on the Apple TV App Store. An average of 447 new apps are added to the store every week. 38% of all apps are games. The categories with the most apps are: Games, Entertainment, and Education. There are more than 20 categories apps can be submitted to but only 7 are currently visible. 85% of paid apps cost between $0.99 and $2.99. Entertainment apps dominate the top charts (28 of the Top 50). Only 8 of the top 50 apps are games.